USA have been inspired by Japan's recent win over South Africa as they seek to make their mark in Scotland's pool, says their assistant team manager. Kevin Battle is hopeful the Eagles can trouble Scotland on Sunday in Leeds. 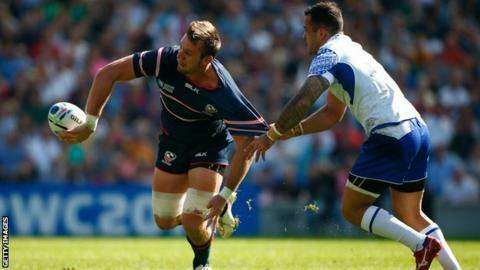 The Scots beat Japan 45-10 after the Cherry Blossoms had caused a surprise by defeating South Africa. "We're going to put our best foot forward and see if we can't recreate those same heroics," said Battle. "Unfortunately, we fell a little short against Samoa - in Sunday's 25-16 defeat. We feel like we have a really great opportunity against Scotland and also against Japan. "Realistically, South Africa are tough, they're really tough but we're certainly going to put our best foot forward. "We really feel we have a great opportunity to have our best showing at the Rugby World Cup. "Japan have been really inspiring, they've done the impossible and I think they've also let everybody else know that it can be possible. "We're big, we're fast, we're physical, we can be very nasty and that's what you'll see out of an American team coming forward." Battle hopes USA's campaign can boost interest in rugby Stateside. "Rugby's still in its infancy in the US," he added. "We still have a long way to go. "It's starting to catch on like wildfire. I'd dare to say that every American who has actually seen rugby has instantly fallen in love with it. "I think this World Cup is vital, both the World Cup and the Olympics next year - the sevens - because this is coming into the televisions in the homes in the US. That's one thing we don't have, we don't have rugby being played regularly on TV. "Once that happens, that'll reach more people. With that, there'll be more excitement, greater participation numbers and therefore, we should be more competitive."